So, they are saying that a journey from Newbury to Penzance (for example) in a bi-mode is better for you than in an ordinary diesel? The Swanage Railway are running a rail replacement bus service from Wareham to Norden for their diesel gala! Cheaper to take the lovely sleeper berths than stay in London. But sitting up overnight? No thanks. I'd agree with that if travelling beyond Exeter - but when journey time is a little over three hours and you arrive at your destination still in the wee small hours, snoozing in a seat is preferable. Unfortunately, snoozing is not an option on the seats provided. I believe that the seating accommodation is primarily for pax travelling from Plymouth into Cornwall or just within Cornwall. Having treated my ladies to a show at the Royal Albert Hall recently, I had occasion to try out the refurbished seating in Coach A of the sleeper [travelling only as far as Exeter]. Both my wife and my daughter delivered a very definite 'thumbs down' to the very hard seats. Both said that, previously, they had easily been able to doze comfortably in their seat - but could not get comfortable enough in the new style seat. I have been told, in no uncertain terms that it'll be a Travelodge in future, returning home the following morning. A more standardised timetable, with fewer stops and faster journeys. London to Plymouth will become hourly calling only Reading, Taunton, Tiverton Parkway, Exeter St. Davids, Newton Abbot, Totnes and Plymouth, with services continuing to Penzance at least every other hour. To serve the intermediate stations there will be a 2-hourly service off-peak, with an extra one in the peak, from Paddington to Exeter (with the odd extension to Paignton/Plymouth), calling Newbury, Pewsey, Westbury, Castle Cary and Taunton. Do you anticipate/has it been confirmed (delete as appropriate) whether Tiverton Parkway will be served by the 'fasts' or the semi-fasts? There’s a nine car IET out in place of a 2+4 today. 5P95 2134 Plymouth to Laira T.& R.S.M.D. <edit> 2P90 1450 Newton Abbot to Plymouth currently showing as cancelled - 'More trains than usual requiring repairs at the same time' - so it'll probably not cover the whole diagram! Restaurant only available to half the train, probably random as to which half. And very limited NON DINING space for any first class customer who gets in the wrong portion. Apparently the instruction is the Pullman should always be in the set at the London end. All very well when reserving your seat - particularly as a 2x5 can turn up in any formation. 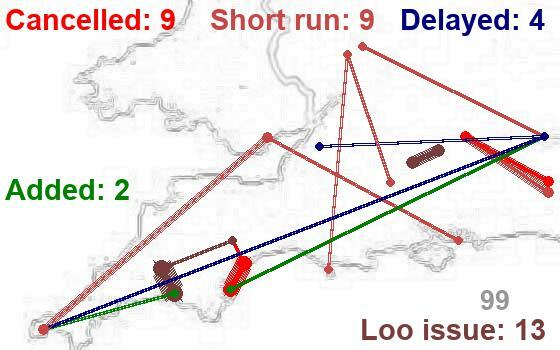 My solution would be to promote cross-TOC co-operation during times of disruption by terminating all SWR Waterloo to Exeter services at Yeovil Junction and having diverted GWR services pick up the station stops between Yeovil Junction and Exeter St.Davids, running to the SWR booked times. Less delay caused by trying to squeeze too many services onto the existing limited infrastructure, and providing the same capacity (although services might be a bit more comfy than usual). Taking the cynical approach............ this would mean having to share revenue between the TOCs - although, probably not so bad now with First having a finger in both pies. It's a pity that the botched new platform and pseudo-heritage horror inflicted on Templecombe constrains potential options there. also, the M5 motorway bridge to the east of Pinhoe only allows for a single track, so that would need to be re-modelled if the line were to be completely re-doubled. Get well soon and take it gentle. Love the pictures of trains as they used to be on that line; a 2-6-4 tank with a rake of green carriages seems so much more "Corfe" than the thing that has novelty value. I remember a couple of happy afternoons in my childhood up on the hill opposite the castle, watch trains (thumpers) calling ... travelling from Waterloo to Swanage, arriving there in 4TC with a 33 for power on what must have been the very dying tail of the through service. I concur. I have a picture of one of those signs too, somewhere. The 'Park & Ride' refers to the facility at Norden and the 'Railway Station' is on the Swanage Railway. Then somewhere along Hadrians Wall ? You are very approximately 400 miles out.